Your desired ClickLock® is not yet available? Than please answer here a few questions on your telescope / focuser. We will gladly consider a production. I have a Celestron Edge HD 8" SCT. After a few months using the 40mm kit eyepiece, I'm looking to purchase a couple of Hyperion eyepieces. What ClickLock components would be required to mount this? Especially if your telescope is mounted on an Alt-Az mount, you can use the Baader 2" NexStar locking ring #245827 instead ot the SC-ClickLock to permanently mount the mirror at the back of the telescope - if you remove the nosepiece from our star diagonals, you get an SC-thread which fits directly at the telescope. This way, so can save some space and do not risk that the telescope hits the base of the mount when you point it high at the sky. I recently purchases a 2" Baader Clicklock visual back to use with my EdgeHD 8" SCT. My issue is that the system is too tight and binds up. When I put a 2" diagonal or eyepiece into the clicklock and go to lock it I can only get about 1/2 of the rotational movement before it gets tight to the point of binding up. What you describe is completely normal. You only have to turn the lever by about 15 - 20° - if really the 2" barrel has the correct standard diameter. The lever moves much further in order to provide secure clamping action also for badly undersized 2" sleeves/barrels, which we have seen in this industry. A 15-20° turn for standard eyepieces will already put a lot of force onto a 2" barrel - you will note that it will hold your eyepiece or diagonal very firm and securely. You should not try to tighten it up as hard as you can! There is no need to extend a large force when clamping an eyepiece. The distinct clicks are part of the design. This was designed to let people hear and feel the lever position also in the dark. What is the optical length for this product (Baader 2" ClickLock CL-SC-Clamp 2956220) ? The optical height of the SC-clamp is 47mm. Please note the technical image to our 2" ClickLock System. Its the first image linked under "Application Images". More ClickLock clamps are in production. Which 2" Baader Clicklock will suit my Orion ED80 CF? given on your focuser or ask a dealer who sell this type. I have a Celestron Edge HD 8" SCT and I would like to purchase your #2956100 Baader 2" ClickLock Diagonal Mirror and your #2956220 SC-Clicklock. I have a Nikon DSLR and that I use with and without a Focal reducer. What other Clicklock products would I need to purchase? I know it is less convenient to change accessory but for astrofotography you have to spend more attention that you´ll be successfull. When will the M68i x 0,75-ClickLock adapter be available? We expect the M68i x 0,75 ClickLock to be in stock by the end of the year. I own a Celestron EdgeHD 9.25 SCT with CPC mount. It comes with 2" back and 2 inch diagonal. Can I replace the back with the #2956233 SCL (3,3")-ClickLock and then interface the Baader 2" ClickLock Diagonal Mirror# 2956100 ? I don't see this combination described in your documentation. If I missed it, apologies. This would allow me to easily rotate the diagonal if needed and would appear to keep focal length very close to original. There is no problem with zenith rotation of OTA. Any comments on doing this are appreciated. Fot the EdgeHD, you can use the 3.3" Clicklock. With this, you can use any 2" accessories. The 3.3" Clicklock only fits onto C11 and C14. I intend to place your ClickLock eyepiece holder on my personal construction telescope. The M64 (Takahashi) or the M60 (vixen) model could suite . But I do not have their thread pitch. What is the thread pitch of the M64 ClickLock (Takahashi ref # 2956264) and the M60 ClickLock (Vixen, ref # 2956260) ? Both ClickLocks M60 and M64 are made with a 0,75er pitch and fits with Takahashi and Vixen. This ClickLock has no stop inside and by that 2" barells etc. can pass thru. I have omegon triplet 102/F7 refractor. I'm not sure the end of focuser tube is S57 diameter or different. I want to change current clamp to baader clamp. thank you. Unfortunately, we do not have the technical data of all telescopes. So, I'd ask you to either measure the dimensions of the back of your telescope and send them to us, or to ask the manufacturer (Astroshop) to provide the data. As they also sell our Clicklocks, they'll probably be able to help you, too. I have two questions about the 2" ClickLock 2" CL-Extension 47mm. 1) How long is the overall length of this adapter including the 2" nosepiece. I know the optical length is 47mm, so how long is the attached 2" nosepiece? 2) How deep can a 2" eyepiece be inserted into this adapter? I have a 2" eyepiece with a 38mm nosepiece. Will I be able to seat it all the way in? The length over all is 74mm so the 2" nose piece telescope side is 27mm long (74mm-47mm). The ClickLock body takes 2" barells up to 36mm deep. Which Baader 2" ClickLock should i choose for my meade lxd55 emc 127 mm refractor ? Unfortunately, we do not have the technical data for all telescopes on the market, especially not for older models. To answer your question, we would need to know which threads are available on your focuser. If this information is not included in the manual, you'd have to contact the manufacturer. If there is no thread available, but the telescope has got enough backfocus and already a 2" clamp, you can use either #2956237 37mm ClickLock extension or #2956247 47mm ClickLock extension, or even the Baader 2" ClickLock Diagonal Mirror #2956100 - then you don't have the Clicklock at the telescope, but at least you can use it whenever you change the eyepiece. Feather Touch Focuser. Think the tread into the focuser is M75X 1 Female Tread. Do you have a 2" ClicLock-clamp for that? No answers yet. Be the first to answer this question! 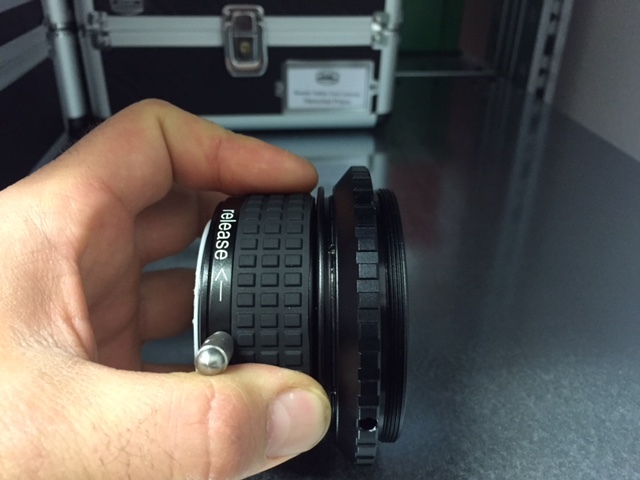 How long is the nose piece (the part that inserts into the focuser tube) on the 37mm extension (2956237)? I have the 47mm extension and the nose piece is 27mm on that one...is it the same? In deed the nose pieces are different. The length of the 37mm version is ca. 24mm. 1. Do I leave the base ring on the SCT (it's mounted quite tight, I haven't been able to remove it with normal force), and just use the 2" threading? Or do I remove the base ring (with extra force?) and use the 2" Baader ClickLock with 3.3" clamp? 2. Do I need to compensate for the extra length of the standard setup cone? And if yes, how is this accomplised? 3. If I want to use the Celestron .7x Focal Reducer for the 800 EdgeHD, I'm assuming this goes between the SCT and the Baader ClickLock? Appreciate your feedback. Thanks in advance! with 1mm pitch. We´re planing to have a M54x0,75 ClickLock soon. We do not have every telescope in stock, and sometimes the specifications change - so, if the thread isn't mentioned in your telescope's manual, it is the best if you measure it yourself. Can you tell me which 2" clamp is appropriate for the Sky-Watcher 8" Flextube SynScan GoTo Collapsible Dobsonian? Does this clamp center the accessory relative to the focuser tube? with a caliper or ruler to be sure. Hello. Is there a Clicklock clamp available for the following refractors? There are no ClickLock Clamps available that fit directly on the focuser of the TeleVue Refractors. We recommend to use a 2" diagonal with 2" clamp like our 2" BBHS mirrors wich meet the quality of these high end refractors. Is the M68 thread on the 2956268 Clicklock adaptor 1.0 mm pitch or 0.75 mm pitch? I have an 8 Edge HD with the Celestron HD Focal reducer and would like to use the combination of Baader ClickLock and a diagonal WITH the Celestron Edge HD focal reducer. 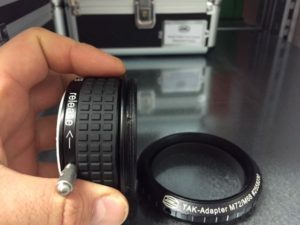 What would be your suggestions if I would like to use the Baader ClickLock system for visual and/or AP, keeping in mind the required 105 mm from Reducer to camera sensor by Celestron, and do I need the Celestron T-adapter also? The SC-Clicklock has got a length of 47 mm, the distance from a T-2-adapter to the sensor of a DSLR is 55mm. Our T-2/2"-adapter #2408150 adds another 2.5mm, so you are at 104.5 mm which meets the tolerances pretty good - Celestron gives a tolerance of +/- 0.5mm for the EdgeHD. You may use the Baader T-2 adjustment/spacer-rings #2458102 for the perfect distance. The Celestron T-adapter is not required then. Visual use is a bit complicated, because a star diagonal like #2956100 already has got an optical length of 112mm incl. Clicklock clamp. You can remove the nosepiece, then you'll have a 2"-thread with which you can attach it directly to the reducer - but you'll need the NexStar Locking Ring #2458270 to rotate it into a convenient position. It is 5mm thick - please check if the thread at the Celestron reducer is long enough. But for visual observation, it is not as critical as for photography - we even have customers who have adapted a focuser to an EdgeHD and are happy with the results. I just purchased your Baader Clicklock SCL #2956233 for my Celestron C11. It screws on smoothly and tightens up very well to the C11 rear cell. Too well. It is very hard to remove once you snug it up. Is there a washer recommended to go between the Clicklock and the rear cell to make it easier to remove? Sometimes I need to reinstall the original visual back so I have SCT threads for my flip mirror. We do not have a washer, although one made of plastic would surely help - similar to our T-2 spacer-rings, which of course are much too small for this use-case. Most people leave the Clicklock-clamp always on the telescope. We do not have ready-made wahers, but to released stuck parts, we like to use sturdy rubber gloves which give you a better grip. Maybe they are also helpful for you. Love my SCT Baader click lock! Do you have one that’ll work for my Explore Scientific AR152 stock focuser? The connection thread from the tube is M68x0,75 which is very unusual and differs to the M68x1 which is actually kind of standart. We were talking about doing ClickLock for Explore Scientific telescopes. Hopefully we have a solution by the end of this year or Jan. ´18. Just visit our website then and when. Will this item (SC) fit the thread of a Meade LX90 ACF 12" telescope please? I believe the thread is slightly different from the Celestron thread. The way we cut the thread it should work - it has on many other customers Meade-OTAs. We can't guarantee it however, since we don´t have Meade telescopes here to test this. The drawing in the application images does not yet include the M54 version. How much is the increase in the optical path length for this M54 ClickLock clamp? 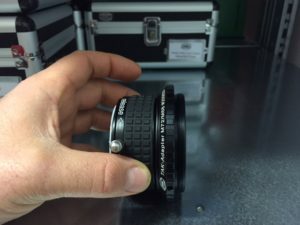 I would like to buy a Clicklock for my Skywatcher Startravel 120 - can you confirm you have a model that fits this focuser? Danke. Or asking a dealer who sells SkyWatcher telescopes to get the specific answer. I'm looking for a 2" clicklock solution to my Explore Scientific 80 mm ED APO. Unfortunately I cant find the appropriate dimension in your selection. The scope side connection has an external M54 threading (0,75). Can you suggest a solution for me, if necessary in combination with an adapter? I earlier purchased a clicklock for my C14 and I am very happy with the quality of this product. which has 2.5" HEX Focuser, which 2" Clicklock Eyepiece Clamp would be appropriate? Also which diagonal would you recommend for use to terminate with a clicklock eyepiece also. Would you suggest attaching the diagonal directly without a compression or clicklock fitting? The female SC thread is 10,5mm long. Thus the optical path length without the thread (and also the full width depth 2" eyepieces can be inserted into the Clicklock) is 36,5mm. I would like to try and figure out which clicklock item I can use with whatever combination I wish to try, but I am finding all this a bit confusing as I don't understand all the various threads etc..
Then you have a standard 2" eyepiece clamp and can use 2"-accessories as before, your old 1,25"-adapter (or an optional Baader 2" to 1¼" ClickLock Reducer #2956214), or for your camera the Baader 2" / T-2 Nose Piece and Camera adapter #2408150 plus T-Ring Nikon to T-2 #2408300. You may need additional T-2-extension tubes to reach focus with your refractor. Never before has an eyepiece clamp for amateur astronomy been so elaborately crafted. Heaviest tested load: complete C14 with SCL 2" ClickLock clamp and a 2" ClickLock mirror diagonal with Scopos 30mm Extreme eyepiece. Attention: not recommended for imitation! The Baader ClickLock (1¼" / 2") is a precisely fitting, very massive eyepiece clamp without clamping screws (!). Inserted eyepieces, CCD cameras and similar accessories are securely held in place, locked against rotation and won't be scratched in any way! With a small turn of 20°, each eyepiece is firmly clamped. You will never have to handle small locking screws again – instead, just rotate the top of the eyepiece clamp for a few degrees, and the eyepiece will be firmly fixed. This is also no problem with gloves on! Our various ClickLock clamps are made of seven precision-machined components which provide a highly effective retention mechanism that securely holds any 1¼" or 2" eyepiece. The clamp is very expensive to assemble, the price therefore initially may appear high for "nothing more than" a clamping device. But if you think about the comfort, precision and stability, it's well worth the money. You do not have to tighten the ClickLock clamps with brutal force, because the mechanical principle comes from professional mechanical engineering. This is how the tool holder in modern CNC milling centers works. Clever use of leverage multiplies the torque. The inserted object is held on three sides similar to a quick-action chuck and can therefore no longer carry out any tilting movements. We have tested the effectivity and stability of the ClickLock mechanism for many years with the 1¼" ClickLock clamp. The 2" ClickLock system is designed to be much more mechanically solid. Even a 20° turn with light pressure of the rotary lever is enough to hold all 2" accessories absolutely securely and firmly. Ratchet function – indicates the position of the clamp acoustically and haptically. So you can know if the clamp is open or closed in the dark and without looking. The heaviest tested load to date is a complete C14 with an SCL-clamp and a 2" Click Lock star diagonal with a Scopos 30mm extreme eyepiece. The C14 has been lifted on the eyepiece. We emphasize that this test setup is not is recommended for imitation. With the 2" Clicklock clamp, you can also convert e.g. your 2" Maxbright mirror (or the 2" universal prism) to the Clicklock system, simply unscrew the old 2" clamp and screw on the new 2" Clicklock clamp. I just received a Baader 2" Clicklock TAK-adapter M72. After a few uses it's spinning where it shouldn't. If I hold the inside on the bottom near where it threads onto the scope it works. Can you tell me what to do? Can I repair it? This might be a mistake done here during assembly. Please try this fix. If it does not help please return the Clicklock clamp to us or to your dealer, we apologizie. Actually the 2"/M72 ClickLock is consisting of the M68 ClickLock and the Adapter M68/M72. There are 6x M2.5 screws underneath the M68/M72 Adapter. These prevent the M68 thread from rotating. It seems that they where not properly tightened. If you grab the very small outer ring on the ClickLock which is part of the M68 Adapter, and remove the M72 Adapter, then you can fasten the M2.5 screws. We hope this helps. Baader 2" NexStar locking ring. Ich habe ein Baader 2" CLICK LOCK ZENITSPIEGEL plus 1X 2" + 1X 1 1/4 " CLICK LOCK am Teleskop HD 8" montiert , da ich nicht genug Halt hatte mit der Original Halterung. Da ich gerne Fotografie bis Visuell arbeite muss ich in Sekunden umstellen können. daher kam auch nur dieses System in Frage. ich würde es begrüssen wenn sie noch Farblich sein könnten so weiß jeder mit welchem Adapter er arbeiten muss im dunkeln und sie werden schnell gefunden. Gebe für alles 5 Sterne 10 Sterne wenn sie Farbig kommen würden. Vielen Dank für Ihr Feedback. Verschiedene Farben sind natürlich grundsätzlich keine schlechte Idee, aber bei der Vielzahl an vorhandener ClickLock-Systeme ist es schwierig hier Farben festzulegen welche sich ja dann auch nicht mehr ändern sollen. Und gerade wenn neue Klemmen dazu kommen ist es oft schwierig hier eine neue, passende Farbe auszuwählen. Das funktioniert bei Okularen mit 6 Stück in einer Serie gut (wie bei den Hyperions), aber unserer Meinung nach nicht bei einem so großen System wie den ClickLock Klemmen. Wir empfehlen Ihnen einfach farbige Aufkleber o.ä. zu kaufen und auf die Klemmen zu kleben. Solide Klemmung die erwartungsgemäß arbeitet. Ich habe sie als Bauteil für eine Okularklemmung an einem Komakorrektor angeschafft. Dieser wird mittels eines schraubbaren Adapters in den Click Lock geschraubt. Die Wahl auf M56x1 Anschluss fiel, weil sich das passende Gegengewinde für mich recht einfach herstellen lies. Der/das Click Lock ist ein wahrer Fortschritt im Vergleich zu der originalen spielbehafteten Okularklemmung des Komakorrektors. Klemmt mit minimalem Kraftaufwand auch schwere Okulare. Ideal an meinem Dobson. Sometimes worried about the safety of your expensive (or not expensive) eyepieces on your telescope? just choose the easiest way to secure them by using a clicklock clamp! I used a M54 clicklock on the former SW NT focuser and it was a real progress. With the S58 clicklock on my new BDS-NT Steeltrack, it is the perfect duo for heavy eyepieces: easy to clamp, perfect fit, never move, excellent prehension, and annular clamping for straightness and to avoid scratch on the eyepiece. just forget screws and try this! (...) Lange gab es keine Möglichkeit die ClickLock Halterung auch direkt mit einem Skywatcher Crayford M54x1 zu verschrauben. Wer diese Klemme nutzen wollte, musste den Weg über die original Klemme oder über diverse Adapter gehen. Dies macht aber in meinen Augen nur wenig Sinn, wenn es darum geht, nicht nur bombenfest, sondern auch sauber auf der optischen Achse zu klemmen. Die neue Version des ClickLock Systems lässt sich also nun direkt Skywatchers Auszug verschrauben. Da dieser OAZ zur Verwendung von weiterem Zubehör, wie beispielsweise Fotoadaptern, zu kurz für die Nutzung von Okularen ist, muss zudem eine ClickLock Verlängerung (in diesem Fall 37 mm) angeschafft werden. Was einem als Erstes auffällt, wenn man die beiden Teile zusammenfügt, ist, wie perfekt sie ineinander passen. Ohne ruckeln, hakeln oder Spiel. Den ganzen Testbericht finden Sie als bebildertes PDF unter dem Tab "Downloads"
I recently received a ClickLock, and can't say enough great things about it - it works great! The threads are as tight as the original thumbscrew clamp, and it holds my SBIG STT-8300M CCD camera and filter wheel very securely (see photos). I am very happy with how securely it locks accessories and it holds my CCD camera orthogonal to the focuser tube without damaging the nosepiece. I originally contacted Baader to obtain the ClickLock M54 for the threaded focuser tube on my Orion 10 Inch Newtonian Astrograph. I sent Baader pictures of measurements of my focuser, since the M54 was originally made for the SkyWatcher Crayford focuser. Baader was very responsive and verified that the M54 would work on the Orion focuser as well. Thank you Baader for making such a great product! This should be standard equipment on all high-end amateur telescopes.